Some fifty years ago, while a cub reporter, Jay Barbree caught space fever the night that Sputnik passed over Georgia. He moved to the then-sleepy village of Cocoa Beach, Florida, right outside Cape Canaveral, and began reporting on rockets that fizzled as often as they soared. 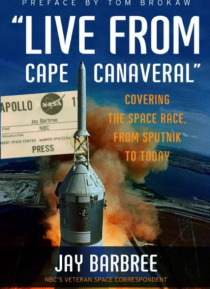 In "e;Live from Cape Canaveral,"e; Barbreethe only reporter who has covered every mission flown by astronautsoffe… rs his unique perspective on the space program. He shares affectionate portraits of astronauts as well as some of his fellow journalists and tells some very funny behind-the-scenes storiesmany involving astronaut pranks. Barbree also shows how much the space program and its press coverage have changed over time. Warm and perceptive, he reminds us just how thrilling the great moments of the space race were and why America fell in love with its heroic, sometimes larger-than-life astronauts.